If you’ve been on the fence about getting a family pet, there’s good news. Owning a pet is actually good for our health, and science even proves it. According to reporting from WebMD, 25 years worth of research has shown that living with pets can help lower blood pressure, lessen anxiety and boost immunity. And it doesn’t hurt that pets are cute and cuddly, and make for an entertaining member of the family. Whether you’re hoping to adopt a pet or just want to create a pet-friendly home for your current furry friends, here are the things your pets need most. Your pets need a cozy place to rest to feel secure. A box with a fluffy blanket or kitty condo with plenty of room to climb is an ideal spot for cats. 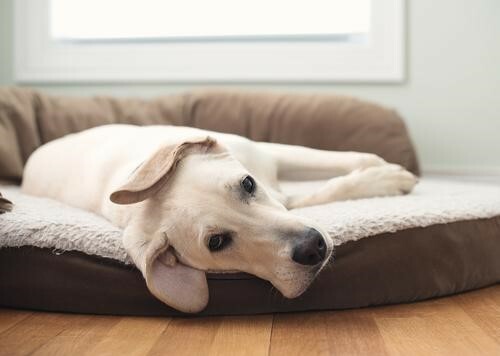 A crate with a blanket may work well for a dog who needs to curl up to feel secure at night. But what about frisky critters like rabbits? Rabbit cages give bunnies their own space to roam, play, sleep and get cozy; and that gives Mom the peace of mind that her family pet is comfortable and has a fun place to live. It may be fun to spoil your pets with treats or provide an easy way to placate them when you’re busy, but it’s a slippery slope. Pet obesity is on the rise. In fact, according to The Association for Pet Obesity Prevention Report, 60 percent of cats and 56 percent of dogs in the U.S. are overweight or obese. Talk with your veterinarian about an appropriate diet for your pets, including which treats and how many per day are OK. Create an eating area in your home with a time-release pet feeder that keeps their food measured and water fresh and clean. You’ll never have to worry about whether your pets are overeating or who fed them last. You can just focus on feeding them nutritious meals and adding in occasional snacks and treats. One of the best and worst things about having a pet is how curious they are. And just like kids, curious pets need to be protected from dangers in their environment. Put away all medication and move cleaning supplies to high shelves or in locked cabinets. Check each room for small nooks and crannies where bunnies, kittens and puppies can wedge themselves and get stuck. Loose wires are also dangerous and can knock over lamps and television sets. Approach each room in your house, including the garage and basement, and think about how you would kid-proof it. Then use those same principles and apply them to pet safety. Pets bring our homes joy and thrive on fun, so give them an opportunity to play and enjoy themselves. Create an area in your home with pet toys and a place to romp around like a sunroom or den. Sit together as a family and play with the pets to create a bonding experience. A pet door is also a great way to give your pet some freedom to play in a fenced-in yard and get some fresh air. When it comes to creating a home for your pets, what they really need are proactive ‘parents’ and lots of love. Focus on giving them comfort, safety and playtime, and enjoy your time together.